Photo Caption A: First-Year Berkeley College Honors faculty Jennifer Juliano, Social Science (second from left), and Patricia Cowan, English, (second from right), both from the School of Liberal Arts, present New Jersey-based First-Year Honors students Donald Hetmanski of Carteret (left) and Jessica Bello of Bloomingdale with awards for academic performance following their research poster presentations at the Poster Session held on July 28, 2017, at Berkeley College in Woodland Park. Awards for academic performance and community service among the First-Year Berkeley College Honors students were announced on July 28, 2017, after the students presented their research posters at sessions held in Woodland Park, NJ, and Manhattan, NY. Academic performance awards were determined by the First-Year Honors faculty, while awards for community service were determined by the number of hours of service contributed during the three consecutive semesters comprising the program. Students from New Jersey who received academic performance awards included Jessica Bello of Bloomingdale, Donald Hetmanski of Carteret, and Joseph Pugliese of Totowa. Aliaa Metawee of Fairview, NJ, received an award for community service. The Poster Sessions included nearly 60 research topics related to the curriculum themes of Global Health and Social Justice, which highlighted a range of subject matters that reflected the students’ individual interests. Many of the students spoke with passion about how the research process their professors led them through became eye-opening experiences. Ms. Metawee is pursuing a BS in Legal Studies. Her research project was titled Covered, But Not a Terrorist: Anti-Islamic Discrimination and Violence in America. Through her research Ms. Metawee found that hate crimes directed toward Muslims increased 584 percent from 2014 to 2016, more than ever before, including after the 9/11 attacks. Photo Caption B: First-Year Berkeley College Honors faculty Patricia Cowan, English (center), and Jennifer Juliano, Social Science (right), both from the School of Liberal Arts, present First-Year Honors student Aliaa Metawee of Fairview, NJ (left), with an award for community service following her research poster presentation at the Poster Session held on July 28, 2017, at Berkeley College in Woodland Park. Mr. Hetmanski is pursuing a BBA in Business Administration – Management. His research project was titled Chill Out: The Importance of Relaxation for Development in Teens and Young Adults. “I am a firm believer that mental health is as important as physical health,” he said. His research found that stress levels are significantly higher in teenagers today compared to teenagers from the 1950s and 1960s. Mr. Pugliese is pursuing a BS in National Security. His research project was titled Put Up Your Dukes: The Controversy Behind Displaying the Confederate Flag. Through his research Mr. Pugliese found that nationwide a large majority support the Confederate flag as a symbol of Southern pride. “People support the flag because they feel it is a part of their roots and where they come from,” he said. 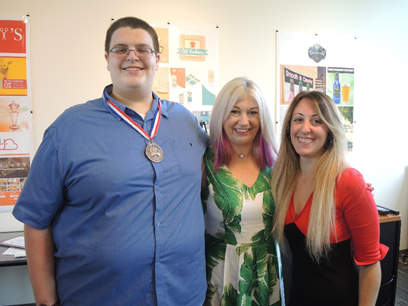 Photo Caption C: First-Year Berkeley College Honors faculty Patricia Cowan, English (center), and Jennifer Juliano, Social Science (right), both from the School of Liberal Arts, present First-Year Honors student Joseph Pugliese of Totowa with an award for academic performance following his research poster presentation at the Poster Session held on July 28, 2017, at Berkeley College in Woodland Park. Other examples of research topics chosen by the students included A Child with Enemy DNA, Live in Fear or Be Sent Away: The Consequences of Operation Babylift; Patriot: Terrorism & the Shattered Sense of Justice in the United States; The Visible Yet Invisible PTSD in War Affected Children; No Care? Know Pain: The Controversial Conversation on Health Care; and Transforming Television: Transgender Portrayals in the Media. The rigorous requirements of the Honors Program at Berkeley College are distinguished by scholarship and service. First-Year Honor Students must maintain a GPA of 3.00 or higher and complete three consecutive Honors Seminars from the fall to spring terms at Berkeley College at one of four campuses: Woodbridge and Woodland Park in New Jersey or Midtown Manhattan and White Plains, NY. The students must also complete 10 or more hours of documented community service from the fall to spring terms.